Anna stands on her island, the island where she has grown up, and she is surrounded by stormy seas. Beyond the sea is mainland Scotland, but she is stuck living in a crumbling castle on the island with a couple of servants, her deteriorating father who is suffering from Alzheimers (at the very least), and the father's assistant, a man Anna sees as attractive—from a child's point of view. One could argue that the antagonist in the story could be any of the characters, but—according to the place where the author ends the story—it turns out to be the sea. 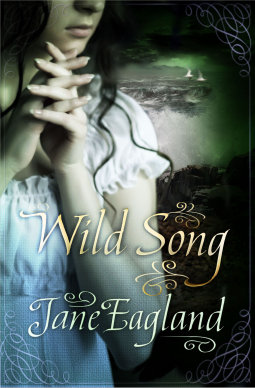 Wild Song looks like a sweet romance, like a Harlequin. The sales press implies a gothic romance. The description is that of Gothic romance. See this? "Living in a creaking castle on a remote, windswept island off Scotland, Anna has never known anyone other than her father, his assistant and their two servants. She is kept away from books, pictures and other children by her father, a mathematical genius, who is slowly losing his mind. Then one wild stormy day a boy washes up on the shore, a boy who will change her whole world" Sounds like a gothic set up, right? Nope. Pay attention to the fine print that indicates that this is a book for third graders. Is this a deliberate misdirection? Is this a cover designer with a certain style that matches that type of story? Is this a press department which only serves gothic romance? Caveat emptor. This is not a Gothic romance. Wild Song is a short story at about a third grade reading level. This fact is not hidden; it is part of the book description, but not necessarily something all book buyers will notice. We have a naive young girl living on an island and though it looks like a genre gothic, is very light on romance (in the genre sense), and it concludes just around the place that a romance might end chapter one. It is a short story appropriate for teenaged (and younger) readers. It does not have the pacing of a book. It has the pacing of a short story, and an abrupt ending consistent with a short story format. The thinking may have been to make this book more appealing to third graders by making it look like an 'older' book. The confusion is inevitable if adult readers glance at the cover and skim the blurb. Not badly done for a third grader's story, but it is what it is. quitoplan emagrece mesmo (cm.aimsttp.org) é vendido APENAS PELO SEU SITE OFICIAL. Comprar quitoplan como usar (www.wakinglife.fr) é bastante simples e resguardado.